SELECTIVELY BREEDING, NOT MASS PRODUCING! Members of the GSDCA and Signers of the "Breeder's Code of Ethics"
European German Shepherd Dogs is a hobby breeder in central Virginia. As reputable German shepherd breeders we offer quality AKC registered German shepherd puppies for sale. Our puppies have close up lines to Germany's finest German shepherd breeders who have generations of dogs that have working titles, hip certifications and have been shown in the Sieger show. Our dog's progeny consist of certified Therapy Dogs, dog's earning AKC obedience titles, training in Search & Rescue and wonderful family companions! 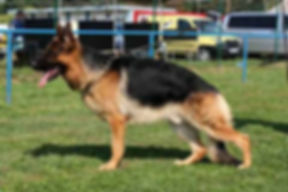 Our male German shepherd, Eros, is Schutzhund titled and has been shown at the Sieger show in Germany. Our foundation is built on the following very successful German showline kennels: von Arlett, von der Wienerau & von Pallas Athene! 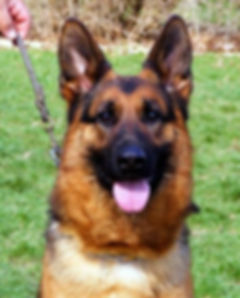 European German Shepherd Dogs is a private home breeder on a family farm located in central Virginia with occasional AKC registered German shepherd puppies for sale. We average 2 litters per year. Notice our motto, "Selectively breeding not mass producing!" Although we have immaculate facilities for our dogs, they sleep in the house with us. Our puppies are born in our home and are handled several times each day. Our AKC registered German shepherd puppies are competitively priced to approved homes & are sold with a hip & health warranty. We are sorry but we do not ship our puppies. We have clients who have driven 12 hours one way to meet their puppy before finalizing an agreement. You will find some of the best German shepherd bloodlines recognized around the world, right here at European German Shepherd Dogs! We are proud to say that we have owned this breed for decades! 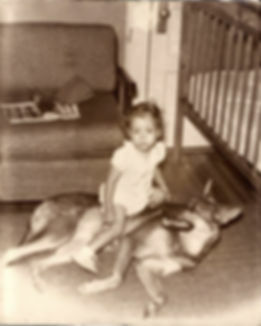 Me & Flicka circa 1957!